Video footage of legendary Swedish guitarist Yngwie Malmsteen performing at the Roland booth during this year's winter NAMM (National Association of Music Merchants) show, which was held January 17-20 at the Anaheim Convention Center in Anaheim, California, can be viewed below (courtesy of "kalibsumter"). Yngwie Malmsteen will attend the Musikmesse Frankfurt 2008 fair in Germany, which runs from Thursday, March 13 to Saturday, March 15. 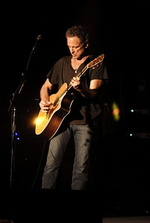 Lindsey Buckingham will release his first-ever solo DVD on March 25. Live at the Bass Performance Hall documents the Fleetwood Mac singer-guitarist's Jan. 27, 2007, concert in Fort Worth, Texas, which previously aired on HDNet. Buckingham's 16-song set included tunes from his 2006 Under the Skin album, other solo material and a few Fleetwood Mac gems. The DVD will come packaged with an audio CD of the gig and a behind-the-scenes documentary shot by Buckingham. Led Zeppelin who last month gave a much-lauded reunion performance in London, may take the show on the road this fall, guitarist Jimmy Page reportedly said today (1/28). Page, who is in Japan promoting the new Zeppelin compilation "Mothership," said during a press conference that a reunion run could happen, but probably not before September. "[Zeppelin frontman] Robert Plant has a parallel project and he is busy with that until September," the Associated Press quoted Page as saying; Plant and bluegrass artist Alison Krauss recently unveiled plans for a tour in support of their joint album, "Raising Sand." Aerosmith guitarist Joe Perry says his band likely will adopt a new, Internet-minded approach to putting out music once its current record deal expires. Aerosmith's commitment to Columbia Records will be fulfilled when they turn in their next studio album, which Perry expects will be completed this year. "After that, I don't know how we'll release music," offers the axeman. "I may just want to release Aerosmith's songs or EPs online after this. There's so many ways to do things now." 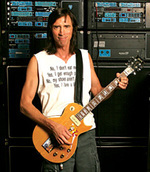 Boston guitarist Tom Scholz reportedly sought to settle the defamation suit he brought against Connie Goudreau and Micki Delp only to have his offer rebuffed by the sisters. A lawyer for guitarist Barry Goudreau's spouse -- who, along with the ex-wife of late singer Brad Delp, is accused of publicly blaming Scholz's actions for Brad's suicide -- called the settlement proposal "a pipe dream" and insisted that the women "haven't done anything [actionable]." 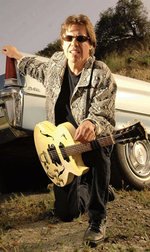 Carlos Santana makes an appearance on SSB, the upcoming debut album from his son's group, the Salvador Santana Band. 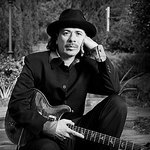 Carlos lends his guitar skills to one track, "Me & U," which was co-written by Salvador and Santana singer Andy Vargas. SSB hits stores Feb. 26. In other news, Carlos will discuss his work on behalf of poverty-stricken children on the March 23 edition of the Discovery Español series Voces de Cambio. 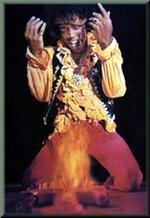 Fuego Entertainment, Inc. today announced it has acquired North American rights to over 200 live performance live music tracks by legendary performer Jimi Hendrix. As part of the previously announced deal with Mr. Jeffery Collins and the formation of the joint venture with Echo-Fuego, Fuego Entertainment has acquired the rights to eleven double albums of live performances by Jimi Hendirx. Album titles acquired under this deal include previously released and never released live performance titles including "Rainbow Bridge Concert," "Axis Outtakes," "Stockholm Concert," "No More A Rollin Stone (Live at the Monterey Pop Festival 67) & Live in Stockholm 67)," "Are You Experienced And More," "Am I Blue," "An Evening With The Jimi Hendrix Experience," "Winterland Nights," "Truth And Emotion," "Axis Bolder Than Love" and "Electric Ladyland & Beyond." 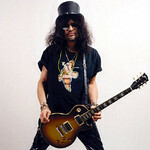 There’s news on the wire that Gibson Guitars plans to release a new Slash artist series line. According to the big boss Henry Juskiewicz, "they're going to go from cheap to high-end custom, personally signed by Slash." The guitars are scheduled to hit retailers on March 15, 2008. According to the Spanish web site RafaBasa.com, AC/DC has been quietly working on its first all-new album since 2000's "Stiff Upper Lip" with legendary producer Robert John "Mutt" Lange, and is planning on releasing the effort — which is rumored to be titled "Strap It On" (a name that has apparently been bounced around for at least the last couple of years) — at the end of April. 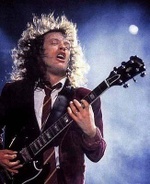 The group's guitarist, Angus Young, is also said to have fully recovered from a recent knee injury which had apparently contributed to the delay in getting the new record completed. Just in case you missed it too! There was all-star New Year's Eve gig in Surrey, England, that featured Eric Clapton, the Who's Pete Townshend and Ringo Starr. The gig was organized by Slowhand to benefit his substance-abuse charity -- an annual tradition of Clapton's -- and also is said to have featured the Eagles' Joe Walsh, as well as a backing band that included Procol Harum's Gary Brooker. Click here for more on the gig. Rhino Records has set a March 18 release date for a "best-of" double-CD from progressive metal giants DREAM THEATER, entitled "Greatest Hit & 19 Other Pretty Cool Songs". DREAM THEATER's new anime-themed video, "Forsaken", will premiere in early 2008. To whet the fans' appetites, Roadrunner Records is offering a peek at the video's main characters at this location (that's Leo on the left and Alice on the right). DREAM THEATER's video for the song "Constant Motion" can be viewed on YouTube. The track comes off "Systematic Chaos", which has sold around 100,000 copies in the United States since its June 5 release, according to Nielsen SoundScan. O.k. I have to admit that the Guitar Hero craze has really annoyed me over the past few years. Primarily, because I sift through hundreds of Google Alerts each day for interesting guitar news for all of you (and me) and that majority of the "guitar" stories that come up are for the Guitar Hero GAME. 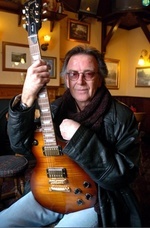 Yes - not a GUITAR! A TOY! That's fairly irritating when a passionate guitar player and publisher is searching for real guitar news. But yes, there is a side of me that is happy to see guitar music being popularized by this game. Kids are finally able to hear and connect with classic and timeless music from Zeppelin, the Allmans, Joe Walsh, and so many more icons of rock guitar. Great stuff! The downside is that if the millions of kids actually spent more time away from this game and focused on the REAL instrument - the guitar - just think about what could happen. 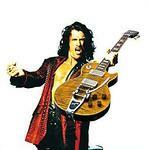 Do you think we could see another Jimmy Page, Hendrix, Duane Allman emerge from the American-Idol-pop-radio wasteland? Could guitar driven music make it's way back to mainstream America? Whatever the answer is, this clip from South Park expresses my feelings perfectly. And also sums up my experience with Guitar Hero when I put down the guitar and tried the game for the first time a few days ago.